Choose vs. Chose: What’s the Difference? Home » Choose vs. Chose: What’s the Difference? Most English verbs are regular. They follow a predictable pattern of conjugation. But some English verbs don’t follow the same pattern. They are called irregular verbs. Choose is an irregular verb that tends to confuse new writers and people learning English. It doesn’t follow the same rules as most verbs, but once you learn the rules it does follow, it’s easy to know whether you should use choose or chose, depending on context. What is the Difference Between Choose and Chose? In this article, I will compare choose vs. chose. I will use each of them in a sentence, and, at the end, I will give you a helpful trick use when you need to determine whether to use chose or choose in your own writing. What does choose mean? Choose (pronounced chooze) is a verb that means to pick one thing over another. Choose is the simple present tense form of this verb. With a helping or auxiliary verb like will or should, choose becomes the simple future form as well. One might choose which sandwich to order from a restaurant, or which night to go out with friends, or which person to marry. Andy has proven time and time again that he will choose money over happiness. “Choose a restaurant quickly, because everything around here closes at 9pm,” Rebeca said. What does chose mean? Chose (pronounced choez) is the simple past tense form of the verb choose. The contestant chose what was behind door number three. Gary could have used this time to prepare for the race, but he chose to fool around instead. We were given a choice between coconuts and starvation, and we chose coconuts. What does chosen mean? The same verb to choose becomes chosen as a past participle, and in past perfect form with an auxiliary verb. Use past perfect tense to describe a past event that happened before a related event. Use a past participle to modify a noun, much the same way you would use an adjective. See the sentences below. Here is a helpful trick to remember chose vs. choose. Chose and choose are difference tenses of the same verb to choose. Chose is the simple past tense form. Choose is the simple present and future forms. If you are speaking about a decision that was made in the past, use chose. 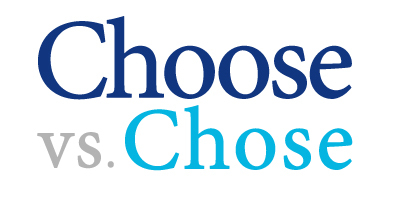 If the decision currently being made or will be made in the future, use choose. Since choose shares a double O with the word soon, it should be easy to remember to save choose for these contexts. Is it choose or chose? These two spellings represent different tenses of the same verb. Choose is the simple present and future tense forms of the verb to choose, which means to select something instead of something else. Chose is the simple past tense form of the same verb. You can remember to use choose in the future tense since that word and soon both have a double O.
I hope this article helped you understand the differences between choose and chose. You can always reread it if you need a refresher. 1 What is the Difference Between Choose and Chose? Steal vs. Steel: What’s the Difference? Faze or Phase: What’s the Difference?